Die Sabbati, videlicet, 21 die Maii. Bp. of Hereford Leave to see his Wife. L. Keeper Leave to be absent. and Leave to go abroad. Tanner released, to follow his Cause. Leat's Cause about Damages sustained by the Spaniards. Militia of the Tower Hamlets to be mustered with the County Militia. Message to the H. C. that the Lords are ready to proceed in Justice Berkley's Trial. L. Herbert returns Thanks to the House for his Enlargement. 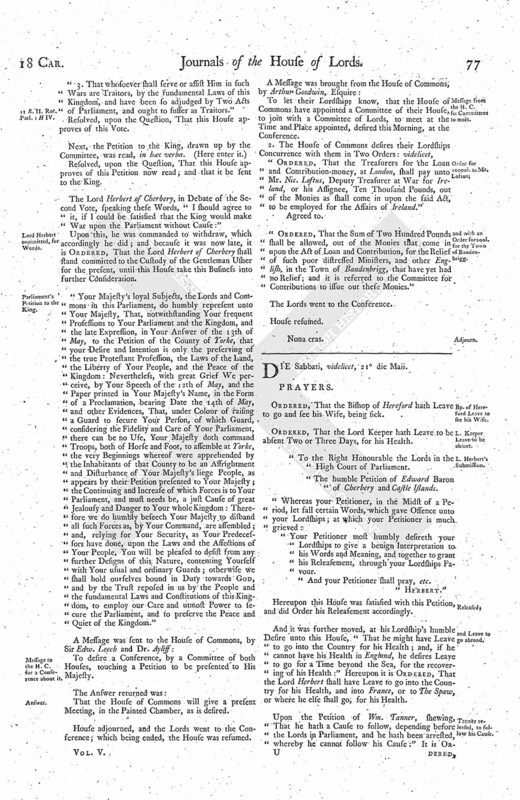 Printer sent for, about the King's Answer to the Ordinance of the Houses, concerning the Militia. Message from the H. C. that they agree to the Votes about the King, with Amendments. Votes and Petition to be sent to the King from the Parliament. Justice Berkley's Trial next Tuesday. Ordered, That the Bishop of Hereford hath Leave to go and see his Wife, being sick. Ordered, That the Lord Keeper hath Leave to be absent Two or Three Days, for his Health. To the Right Honourable the Lords in the High Court of Parliament. The humble Petition of Edward Baron of Cherbery and Castle Islands. Your Petitioner most humbly desireth your Lordships to give a benign Interpretation to his Words and Meaning, and together to grant his Releasement, through your Lordships Favour. And your Petitioner shall pray, etc. Hereupon this House was satisfied with this Petition, and did Order his Releasement accordingly. And it was further moved, at his Lordship's humble Desire unto this House, "That he might have Leave to go into the Country for his Health; and, if he cannot have his Health in England, he desires Leave to go for a Time beyond the Sea, for the recovering of his Health:" Hereupon it is Ordered, That the Lord Herbert shall have Leave to go into the Country for his Health, and into France, or to The Spaw, or where he else shall go, for his Health. Upon the Petition of Wm. Tanner, shewing, That he hath a Cause to follow, depending before the Lords in Parliament, and he hath been arrested, whereby he cannot follow his Cause:" It is Ordered, That the said Tanner shall be released from his present Restraint, to follow his Cause, provided he be not upon Execution. The Earl of Bristoll signified to this House, "That he was well acquainted with the Cause of Depredations concerning Leat; and about Five and Thirty Years ago he knew that there was a Prosecution of Law in Spaine, concerning this Business, and it proved to be a very just Cause; for, upon sundry Hearings, there were Judgements given thereupon, and Execution accordingly had, for the Value of Two or Three Thousand Pounds. And the Party that followed the Business, and knows all the true State of the Cause, shall attend the Lord Admiral, to inform his Lordship thereof. In regard the Hamleters of The Tower of London are not to be drawn out in Trained Bands beyond their Liberties, (fn. 1) without Order from the Lieutenant of The Tower; the Earl of Holland, Lord Lieutenant of Midd. shall give an Order to the Lieutenant of The Tower, to cause the Trained Band of the Hamlets to be mustered on Thursday next, with the Trained Bands of Midd. To let the House of Commons know, that their Lordships are ready for the Trial of Mr. Justice Berkley. Hodie 1a vice lecta est Billa, An Act to call an Assembly, etc. Ordered, To be committed to a Committee of the whole House, to be debated on Thursday next. The Lord Herbert gave this House humble Thanks for their Favour towards him, in releasing him upon his Petition, and professed he meant no Ill, neither to the King nor to this House, by those Words he spake; and desired their Lordships Pardon for those Words that fell from him. The House was informed of a Book, intituled, An Answer to the Declaration of both Houses concerning the Militia, which was put forth in the Name of the King, which the House (fn. 2) conceives to have many Expressions in it, which laid an Imputation upon the Parliament: The House Ordered, That the Printer should be presently sent for, to attend this House, and bring the Warrant or Authority with him for the Printing of this Book. 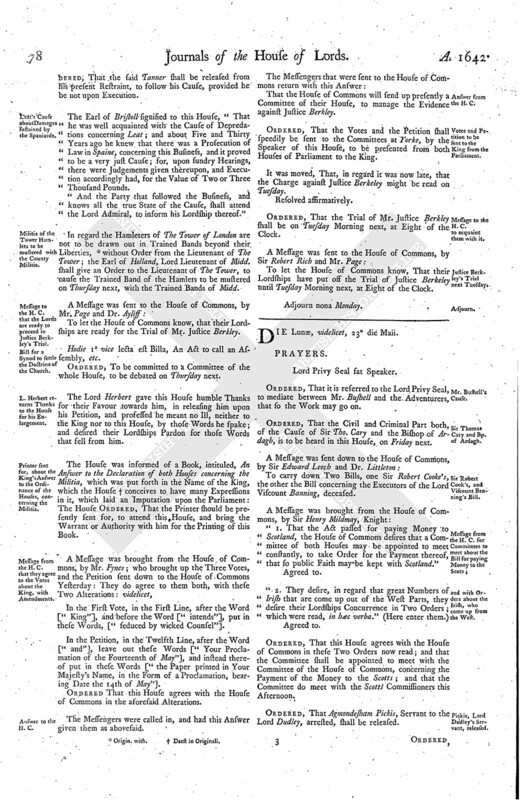 In the First Vote, in the First Line, after the Word ["King"], and before the Word ["intends"], put in these Words, ["seduced by wicked Counsel"]. In the Petition, in the Twelfth Line, after the Word ["and"], leave out these Words ["Your Proclamation of the Fourteenth of May"], and instead thereof put in these Words ["the Paper printed in Your Majesty's Name, in the Form of a Proclamation, bearing Date the 14th of May"]. Ordered That this House agrees with the House of Commons in the aforesaid Alterations. The Messengers were called in, and had this Answer given them as abovesaid. That the House of Commons will send up presently a Committee of their House, to manage the Evidence against Justice Berkley. Ordered, That the Votes and the Petition shall speedily be sent to the Committees at Yorke, by the Speaker of this House, to be presented from both Houses of Parliament to the King. It was moved, That, in regard it was now late, that the Charge against Justice Berkeley might be read on Tuesday. Ordered, That the Trial of Mr. Justice Berkley shall be on Tuesday Morning next, at Eight of the Clock. To let the House of Commons know, That their Lordships have put off the Trial of Justice Berkeley until Tuesday Morning next, at Eight of the Clock.